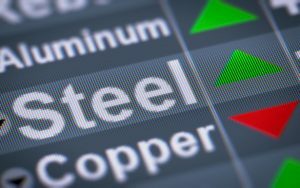 The World Steel Association yesterday released its Short Range Outlook (SRO), in which it forecasts global steel demand to grow 3.9% in 2018. Global steel demand is projected to hit 1,657.9 million tons (MT). Meanwhile, the SRO forecasts global steel demand will rise by 1.4% in 2019, hitting 1,681.2 MT. Within the U.S., Canada and Mexico, 2018 demand is forecasted to rise by 1.7% in 2018 and 1.0% in 2019. E.U. demand is projected to rise 2.2% and 1.7% in 2018 and 2019, respectively. In Asia and Oceania, demand is projected to rise 5.0% this year and 1.3% next year. Unsurprisingly, the SRO refers to rising global trade tensions. Of course, that tension has a hand in the projected deceleration of demand growth in China, pending government-led stimulus measures. Elsewhere, the report states the E.U.’s steel demand recovery will continue in 2019, driven by domestic demand. The outlook for Japan is continued stability, the report states, while South Korean demand is expected to contract in 2018, with only a “minor recovery” projected for 2019. The full SRO report is available here.